May 9, 2018 -- Dentists are increasingly using CAD/CAM software to plan implant procedures and create abutments. But do digitized mucosal margins actually match those in patients? Researchers of a new study decided to find out. The researchers placed and scanned 257 implants to calculate the distance between the mucosal margin and abutments created by CAD/CAM processes. They found that distance between the two was the same or larger in the vast majority of patient cases, suggesting that CAD/CAM can be effectively used to create abutments. "The aim of the current study was to evaluate whether a computer-planned submucosal position of the abutment shoulder would be in concord with its intraoral position after implant delivery and its functioning," wrote lead study author Jan Pietruski, MD, DDS, PhD, and colleagues (BMC Oral Health, May 2, 2018). Dr. Pietruski is a private practice dentist from Białystok, Poland. Dental professionals are increasingly using CAD/CAM software to plan implant procedures and create abutments, but research is limited on whether the software accurately predicts margin distance. Therefore, the researchers decided to investigate whether a potential mismatch exists between the simulated margins and their actual clinical presentation. They began their observational clinical study with 59 patients who needed at least one dental implant. All patients had good oral hygiene and no inflammation following scaling, root planing, and periodontal treatment. The patients received a total of 257 implants. About 1.5 months after implant placement, the researchers uncovered the implants and took open-tray silicon impressions, which were sent to a CAD/CAM center in Sweden. The center designed and milled titanium abutments using the Atlantis software suite (Dentsply Sirona). Once the researchers acquired the milled abutments, one clinical examiner measured the distance between the abutment shoulder and gingival margin on two occasions: after the abutments and initial, temporary crown were placed (T1) and then after the permanent crown was cemented (T2). 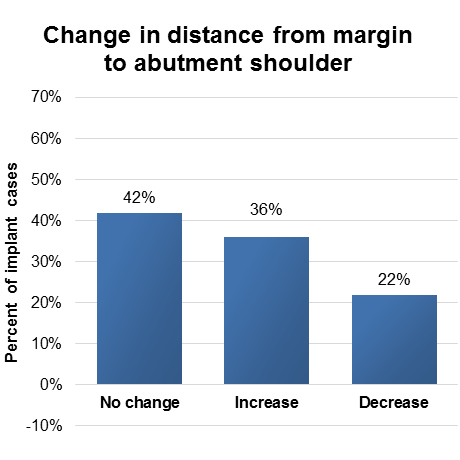 The distance between the mucosal margin and abutment shoulder either did not change or increased in about 80% of all implant cases. However, the distance decreased in about one-fifth of cases. "Confirmed in 80% of cases, soft-tissue stability or growth is a very positive point in favor of using computer-designed manufactured abutments," the authors wrote. "However, soft-tissue deficiency in over 21% of all cases poses a serious problem, so to avoid such risk, we suggest that the shoulder of a CAD/CAM abutment should be set slightly deeper submucosally than CAD software recommends." For the canines and incisors specifically, the distance between the mucosal margin and abutment shoulder increased or remained the same in 84% of all cases. This is especially important for aesthetic purposes, the authors noted. "Moreover, a strong positive correlation was evident in all implants across the aesthetic region at T1," they wrote. "This result is particularly significant as it affects the aesthetic outcome in the anterior maxilla." Despite their best efforts, the researchers noted that some measuring errors or other human errors may have occurred during the clinical process. Furthermore, they rounded up to the nearest half millimeter when measuring, which may have resulted in slightly imprecise results. Nevertheless, the study findings showed that CAD/CAM may be a reliable tool for planning implant procedures and creating abutments. However, more studies are needed to verify these results, the authors cautioned. "Within its limitations, this study concluded that the technique using a computer-designed position of the abutment shoulder in relation to the mucosal margin can be predictably implemented in clinical practice," the authors concluded. "The results presented above need to be confirmed in further studies on larger groups."